The people I've helped to learn Guarani are now all over Paraguay doing a variety of different tasks. I thought it would be interesting to link to some of their pages and blogs so that you can see who they are. My very first student, way back in 1995, when I began writing the Guarani text, was James Arritt. Though he's no longer in Paraguay, Paraguay is still in him, as evidenced by his website offering yerba mate for sale. When the Guarani-Jopara Institute for Missionaries started up in 2000, the first students were Dan and Christie Reich who now live and work in the town of Yuty, about 140 km from where we live, as the crow flies. The same year we were joined by Lindsay Gilliam who had already been a Peace Corps volunteer in Paraguay so he knew some Guarani. Although he just moved to Loja, Ecuador, Guarani has turned out to be very important for him, because he married Eva, for whom it's a first language! Check out their video on YouTube. That's the first class above: L to R; Andy Bowen, Christie Reich, Dan Reich, Lindsay Gilliam, language helper Irene Ayala. Subsequent students now working in rural Paraguay include Jeff and Amy McKissick, who operate a mobile medical clinic in the village of San Francisco; Tom and Kelly Stout, who also work in rural Paraguay, though they're currently in the U.S. (check out this exciting project that the McKissicks and the Stouts are involved in! 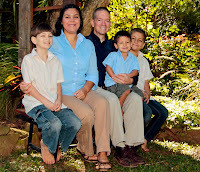 ); John Griffin, in Tobati, and Paul and Marla Fields, who direct the work of ABWE in Paraguay. Their daughter, Shellie Silva, studied with us in the same class--she's married to a Guarani speaker. Another ABWE missionary, Laura Fouser, is now located across the border in Campo Grande, Brazil, having learned Spanish, Guarani, and now Portuguese. A short-termer from the International Mission Board of the Southern Baptist Church named Tonya VanKampen has since married and lives with her husband Kris Dixon in the U.S., though by the looks of their blog they're still very involved in missions! Other former students who don't seem to have blogs include Dan and Sarah Hough, who live in Caazapá; Gil and Renita Rempel, in Campo 9; Erna Plett and Esther Goertzen, in Caaguazú (the Rempels, Erna, the Goertzens, and the Zachariases are all members of the Evangelical Mennonite Conference); and Steve and Marilyn Haines, who seem to be living in Loma Plata, in the Paraguayan Chaco. Their daughters Rachel and Rebecca studied with us too. My current class has four students: Greg Cameron (his wife Vonnie studied last year), Travis and Rosey Zacharias, and my wife Lizet. Here's the current class: L to R; Travis, our language helper Norma, Greg, Lizet, and Rosey. The best I can tell, I've had 28 missionaries study with me since the Guarani institute opened in 2000. I've invested in their lives and now they are investing in the lives of countless others using the resource of Guarani. we are happy to be apart of your ministry!!! You didn;t mention your short-short-short-short class (6 hours, i think) that you offer in May (TIME). i didn't even realize that we were featured on that SIM web site until i clicked on your link. how funny! Okay, any chance there really is a short-short-short-short class in May? I'd sure be willing to drive out to Escobar to be there! I'm trying hard on my own, and I really see the difference when I try to speak to our neighbors in their native tongue, but I'm slow at learning from paper... AAAA! HELP!!!!! Hi, Ken and Christie! I would really, really love to be able to help you! The May class Amy was talking about is for their group of students (Training in Medical Evangelism=TIME) that will be doing something like two days of Guarani intro as part of their orientation.